I was recently interviewed by the New York Times on the issue of Citi-Bikes and "bar hopping" as well as the legalities of biking while intoxicated in New York. Below is the full text of the Article published in the New York Times. It started as a normal date night: Shawn, a bearded graduate student who favors lumberjack plaid, went to Williamsburg for dinner and drinks with his girlfriend. But instead of taking the L train from their Chelsea apartment, they decided to ride Citi Bikes there and back. A couple of cocktails at the Wythe Hotel led to beers at Mable’s Smokehouse and a nightcap at Post Office, a dive-like whiskey bar. After four or five drinks, they undocked a pair of blue bikes and rode home over the Williamsburg Bridge. As usual, Shawn sped ahead, and as they ascended over the East River, he turned around to see where his girlfriend was. That’s when he lost his balance, kicked his foot into a bridge railing and broke his toe. Citi Bike, the city’s newest form of public transportation, is colliding with one of the city’s favorite pastimes: bar hopping. While ridership peaks during the day (for commuting to work, running errands and sightseeing), some New Yorkers are beginning to see it as a convenient way to explore the city’s night life, despite the obvious pitfalls of getting behind those handlebars after a drink or two. For bar crawlers on a budget, the bike-share system beats paying for a cab; rides under 45 minutes are complimentary to members who pay a $95 annual fee. It’s also better than sweating on a subway platform and woozily waiting for a train after a night of partying. This is especially true now, when late summer breezes make cycling almost bucolic. “At night, not to sound cheesy, but you have the wind at your back and you just feel carefree,” said Jillian, a bubbly 29-year-old brunette lawyer in Chelsea who has been to known to joy ride on a Citi Bike after a few cocktails. But is it illegal? Technically, no. While cycling under the influence is not explicitly against the law in New York City, a drunk rider can be charged with disorderly conduct or reckless endangerment, just as a pedestrian can. The program’s user agreement prohibits riding “under the influence of any alcohol, drugs, medication or other substance,” but no one’s handing out breath testers at docking stations. Likewise, there is no way of knowing how many of the 245,000 riders have done so while inebriated. But while there has only been a handful of Citi Bike injuries reported, anecdotal evidence and post-pub interviews suggest it has started to become a hazard of night life. 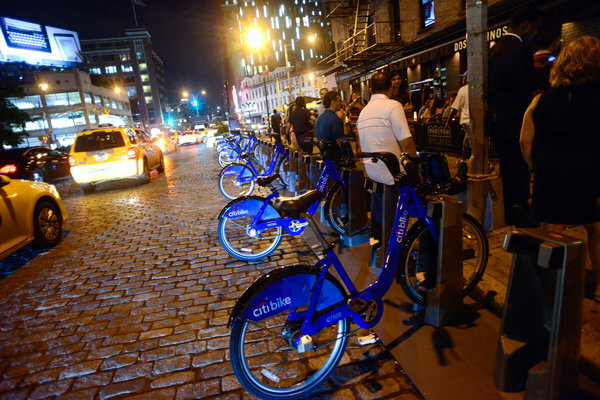 For many late-night revelers, the temptation to hop onto a Citi Bike is too great to pass up. Michelle Young, the founder of the Web site Untapped Cities, frequently cycles from the Lower East Side to her home near Columbus Circle after a night out. After the gay pride march in June, she picked up a Citi Bike on Washington Street and “weaved through the drunk crowds” to get uptown. A cab would have cost about $10, and she estimates that she has more than recouped the bike-share membership fee by forgoing taxis and MetroCards. Cycling also adds a touch of whimsy to the usual bar crawl. Earlier this month, Monica, a 26-year-old college adviser, used the bike-share program for a “Sunday Funday” bar crawl with two friends. They bought day passes in Murray Hill and took advantage of half-off drink specials at Destination bar in the East Village before heading to Blind Tiger in the West Village and Meatball Shop in Chelsea. 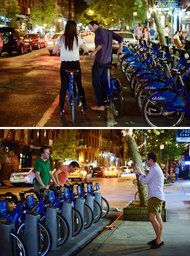 The Citi Bike program attracts a late-night crowd. Indeed, some Citi Bike users say they are more likely to go out at night and perhaps venture a bit farther now that everything is a carefree bike ride away. That may explain why docking stations in bar-heavy areas like the Lower East Side and the meatpacking district become increasingly empty as night ticks toward morning. According to Bike Share Map, an independent Web site that analyzes data from bike-share programs worldwide, rides between 9 p.m. and 5 a.m., prime hours for night life, accounted for 164,500 of the 1.1 million Citi Bike rides between July 17 and Aug. 16, or about 15 percent. The top five most active docking stations were located in night life districts: the East Village (Lafayette and East Eighth Street), West Village (Carmine Street and Sixth Avenue; West Fourth Street and Seventh Avenue), Chelsea (Eighth Avenue and West 31st Street) and SoHo (Cleveland Place and Spring Street). “You’re not getting commuters during this time,” said Oliver O’Brien, a researcher in data visualization at University College London, who runs the site. “It’s mainly people going out.” There are caveats. The statistics don’t account for bikes that are undocked for maintenance or redistribution. And it can’t be assumed that everyone riding at night is drunk. But that pales in comparison to having an collision. Just ask the 27-year-old lawyer who was riding home to Gramercy Park in June after drinking a half-dozen beers at the Parlour, an Upper West Side bar. As he rode through Columbus Circle, his handlebar clipped a taxi’s mirror, flinging him onto the curb and his bike under the taxi. Luckily, no one and nothing was hurt (the bike was unscathed). Despite the nerve-rattling experience, he still rides tipsy. “I just avoid Columbus Circle when I am,” he said. Luck seems to be on his side. Emergency room and city officials say they have not seen a notable spike in bike-related accidents since the 6,000 Citi Bikes were unleashed on the city streets in May. “There’s no obvious sign that there have been more bike injuries,” said Dr. Marc Stoller, the associate chairman of the emergency department at Beth Israel Medical Center, which serves much of Lower Manhattan. And according to the city Department of Transportation, there have been eight Citi Bike injuries reported through Aug. 20 (the agency does not track whether crashes are alcohol related). A representative for Citi Bike declined to comment further on accidents or the issue of members riding while under the influence.